This month marks the end of my Maytag Moms journey. I have enjoyed letting you take a peek at our new kitchen and sharing how I've been getting along with all my new appliances. It's definitely been a wonderful experience. 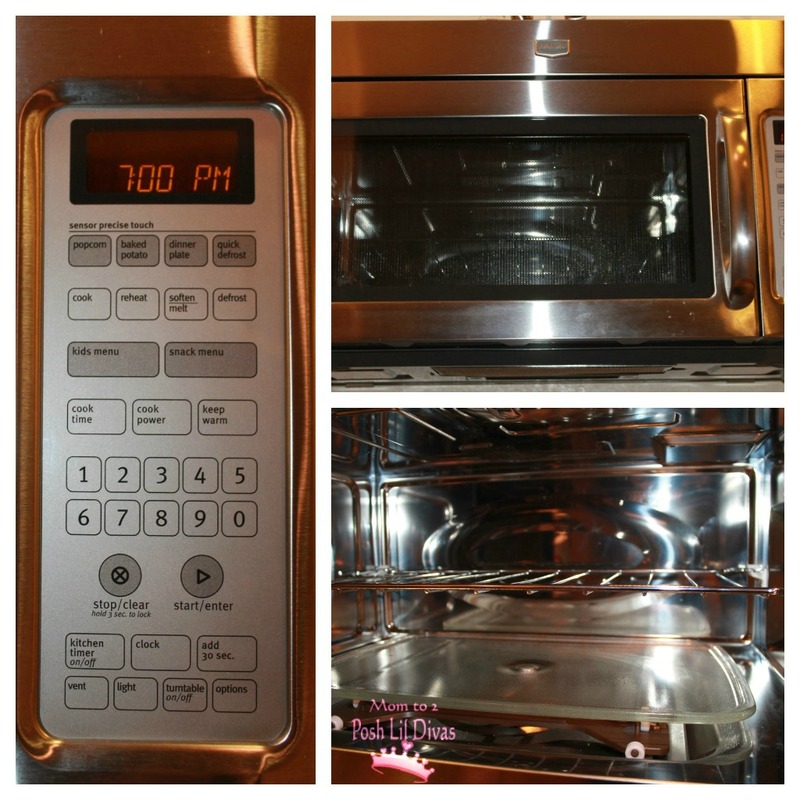 Today, I am going to give you a sneak peek into the final two appliances - my over the range microwave with stainless steel interior and our Jetclean Plus Dishwasher. Do you recall the days where you basically had to wash your dishes by hand before putting them into the dishwasher? I do! It was my #1 reason for never using our previous dishwasher. I always felt like it was such a waste of time since I basically had to wash my dishes before loading anyway. Do you know what we used our previous dishwasher for? It was a high capacity drying rack. I even wrote about it in a post. Now that I shared that confession with you, I know you're wondering if we ever use our new Maytag Jetclean Plus Dishwasher. The answer is - YES! We use it all the time (ok, more like a few times a week but that's HUGE for me!). The Jetclean Plus Steam cycle utilizes high pressure spray jets and increased (it's HOT!) temperatures that actually get your dishes clean. Really clean without pre-washing - clean. No scrubbing required. Your mom's (or even your own) old Maytag couldn't do that, right? Maytag embraces new technology and they continue to innovate, making their appliances better than previous ones while still offering the same dependability that generations of users have come to expect. As a modern day Mom, it's all about making my life easier. If it doesn't help me save time or simplify my daily routine then it's not worth the effort. My new kitchen requires very little effort on my part and has definitely both saved me lots of time and made my life easier. Take my over the range microwave with stainless steel interior for example. This isn't just a good looking machine (it is though, isn't it?!) 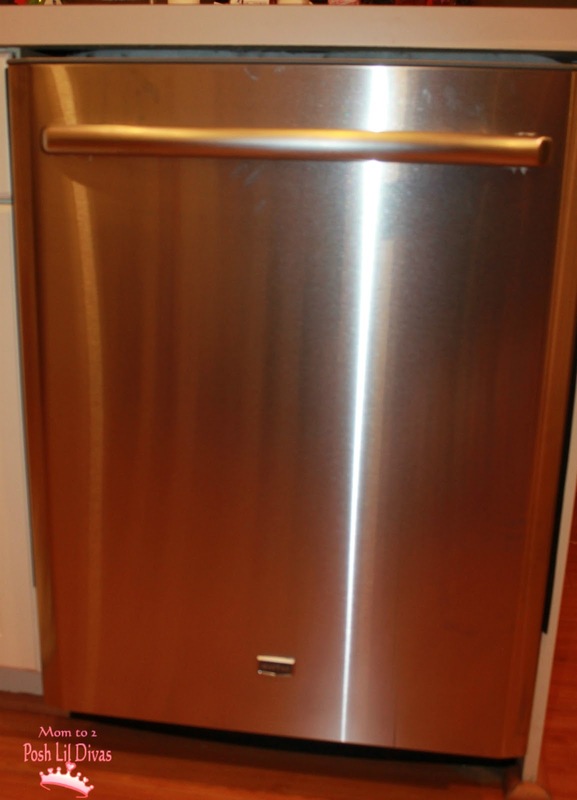 - it is the 2nd most used appliance in our kitchen on a daily basis (the fridge is definitely #1). This is 1,000 watts of cooking power awesomeness. I LOVE the WideGlide tray. When I first saw it, I was doubtful. I was so used to the circular rotating tray on our previous microwave. When I saw this tray moving back and forth I thought I had put it on incorrectly or that it was broken. Seriously, I had to double check the manual. We get so stuck in what we are used to that anything new seems wrong at first, doesn't it. Well, this my friends is definitely the right technology for reheating or cooking food. It allows for nice uniform cooking. No more poking your finger into your casserole and finding the middle cold while the top is piping hot. Now it all heats evenly - hooray! Honestly, it is cause for a mommy celebration. You don't know what a time saver it is not to have to keep moving your food around and adding additional minutes. With our old microwave, reheating was almost like re-cooking because I had to babysit my food - stir, turn, add another minute, repeat. I know many of you know what I mean and you can appreciate why I am so excited to have left that all behind. My other favorite feature on the microwave is the sensor reheat for our leftovers. If I didn't know better, I'd think this appliance had a little magic to it. 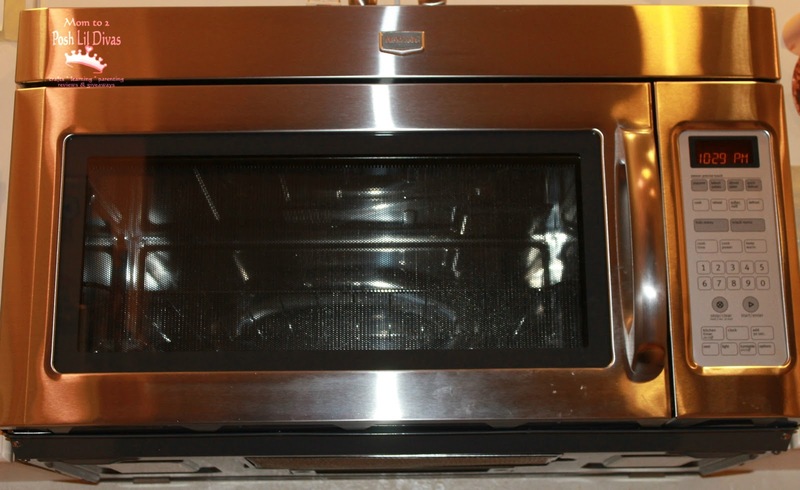 The sensor reheat allows you heat food without setting a time or temperature. It "senses" the food and does it for you. I was quite skeptical of this at first. I was actually feeling quite smug and waiting for the feature to fail and be wrong. It wasn't. It actually heats up the food really well. Color me surprised and quite happy about being wrong. The thing I have come to appreciate the most about the microwave (and ALL my Maytag appliances) is how easy it is to clean. The stainless steel interior makes clean up a cinch - with just a few quick wipes, it's sparkling like new. This comes in very handy at our house as we are known to regularly conduct experiments in our microwave that may or may not involve things like exploding soap. If you missed any of our other Maytag Mom posts be sure to check them out, especially if you are in the market for new kitchen appliances. If you want more info you can also check out Maytag on Facebook and Twitter. I have a Maytag dishwasher that looks a lot like yours (it's nearly six years old now) and it still works beautifully without any pre-washing. My mom was amazed at how well it worked when she was out here visiting. LOVE it! That's to funny about your mom Maryanne - that's because all those "old" washers needed lots of pre-washing. It's a huge time saver isn't it. I hate useless dishwashers, too. 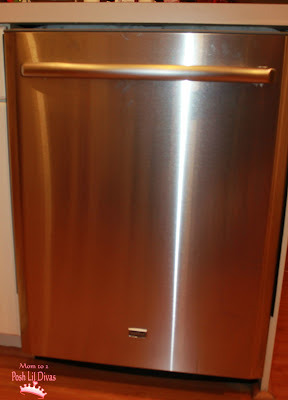 When we're ready to buy new appliances, I'm coming back to these posts and asking you what you think. Trisha, that was one "option" I was very skeptical of and have grown to LOVE. It's pretty awesome. My husband does real estate development. I'll steer him to your post for appliances! I do rely on my dishwasher. Whenever it's broken, it is a serious traumatizing for us to wash all the dishes by hand. I can't imagine doing it that way every day. We are lucky to live in this modern era! We are very lucky to live in this modern era and have all these nifty appliances and technologies that save us time. I can't imagine having to do it all myself. I don't think I could live without my dishwasher! I'm so jealous of your Maytag!!! 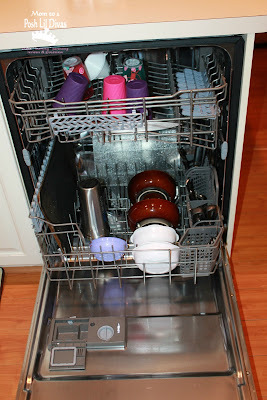 Krissy, I am a dishwasher convert, hehe. I never used them until now. I was missing out! Oh, I want a Maytag dishwasher so badly. I have to scrub all of my dishes and they still don't come clean. Crystal - imagine all the "extra" time you would have to play in the bath with your girls if you didn't have to scrub the dishes - hehe. It is a huge time saver and I am becoming very spoiled. I never used one until I got our Maytag. Ohhh to get Maytag in the UK that dishwasher is gorgeous - I am buying one this weekend (7 long months since ours broke) and wish we could have one like that. My hands will be back to being soft once again. I'm not going to lie, I'm a little jealous! Mostly though, I'm very happy for you and your gorgeous new kitchen. Hey, do you still wipe the water off your dishes? Pressure can't really do all the job all the time, but as I can see you are pretty amazed with the dishwasher. Hoping to get one soon! Emily the dishwasher leaves the dishes dry with a heated end setting. I have not had to dry them or had spots - so excited to have this dishwasher. It has saved us so much time. Hope you get your new one soon. The dishwasher container looks like walk-in fridge it's good to see things like that. I would probably take your advises here in article.